Western blot analysis of extracts of various cell lines, using CHAF1A Polyclonal Antibody at 1:1000 dilution. Chromatin assembly factor I (CAF1) is a nuclear complex consisting of p50, p60 (CHAF1B; MIM 601245), and p150 (CHAF1A) subunits that assembles histone octamers onto replicating DNA in vitro. 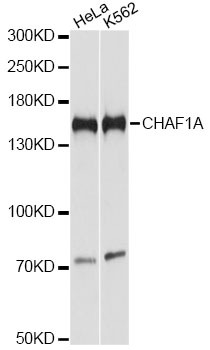 CHAF1A Polyclonal Antibody. Unconjugated. Raised in: Rabbit.